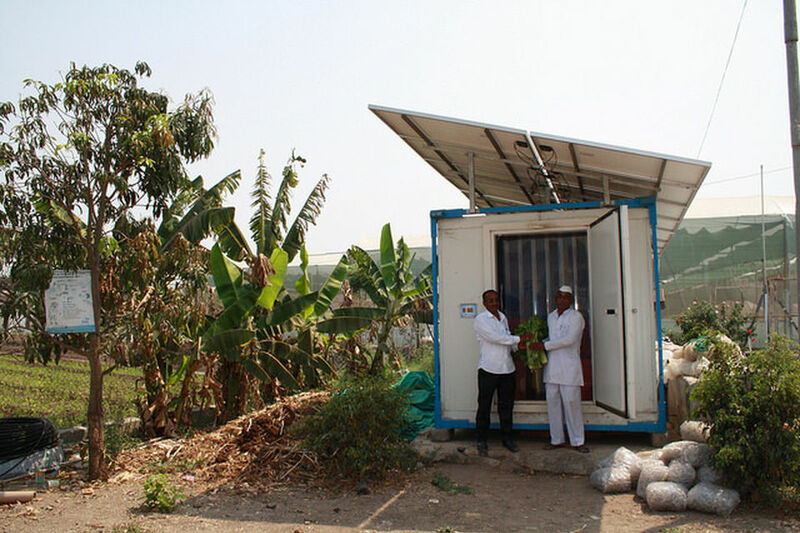 Ecozen Solutions is an Indian company specialising in portable solar cold rooms which have thermal energy storage and are designed to work even in low sunlight. The farmers using the cold rooms have seen significant increases in their profits. Ecozen received my vote due to the strength of linkage between energy and agriculture/food preservation. As we assess the linkages between energy access and other SDGs, the linkage to food security, and income generation/productive uses is one which needs stronger examples, and Ecozen provides one. India loses more than 18% of its fruits and vegetables per year due to lack of quality infrastructure and cold storage facilities (CII). This presents a food security issue, especially for those living in poverty, and exacerbates environmental degradation. Cold storage facilities are a key solution to reducing waste and increasing income for farmers. However, cooling is currently only available for 10% of perishables in India, leaving 370 million tonnes at risk (Indian Institute of Management, Kolkata, 2014). Most cooling solutions are also carbon intensive and unavailable for farmers living in energy deprived regions. 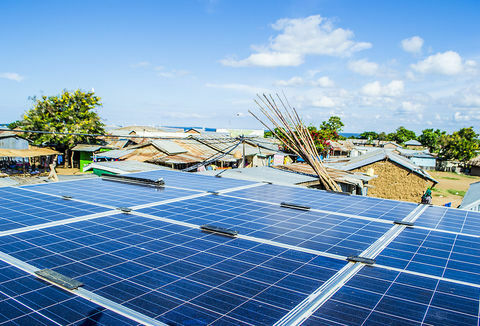 There is a clear demand for sustainable off-grid cooling solutions, particularly at the ‘first mile’ when produce has just been harvested and its quality starts to rapidly decline. 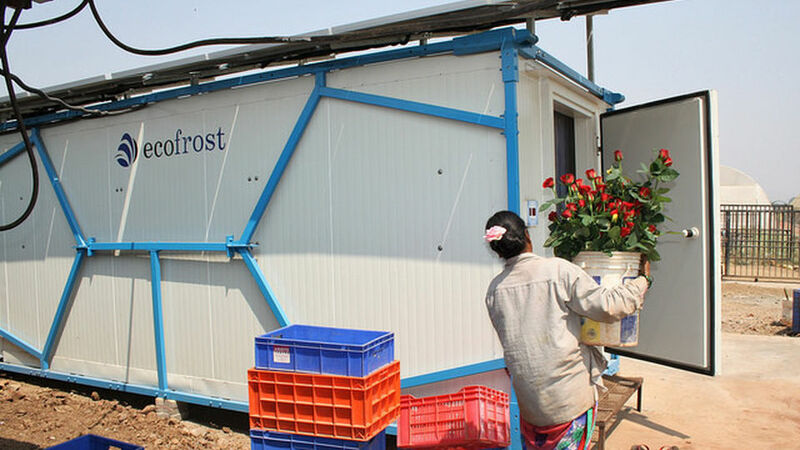 Ecofrost is a portable solar powered cold room which enables farmers to store post-harvest produce at optimum temperatures. This maximises its shelf-life and enables the farmer to supply quality produce to the local market at the right time, as well as sell it at markets further away, ensuring better returns. The systems are used mainly by horticulture farmers to store fruits, vegetables and flowers. Equipped with 4kWp of solar PV, the Ecofrost is designed to work in low sunlight. The cold room uses thermal energy storage to provide back-up during non-sunshine hours through metal plates, with both forced convection and radiant cooling. The system can maintain temperatures from 4°C to 10°C for up to 30 hours. Where available, Ecofrost can also be powered by mains electricity. The thermal storage technology used in Ecofrost is more efficient than chemical batteries and Ecozen has developed its own condensing unit which allows the systems to work even in early mornings and late evenings when solar irradiation is low. Ecofrost can also be controlled via Bluetooth through a mobile app. Simply by tapping on the image of a product, farmers can control temperature, humidity and air quality parameters, and they can access information on the product’s shelf-life. The app also has a remote monitoring feature, so that Ecozen can understand how customers are using the cold rooms. Technicians are available locally to provide after-sales service. 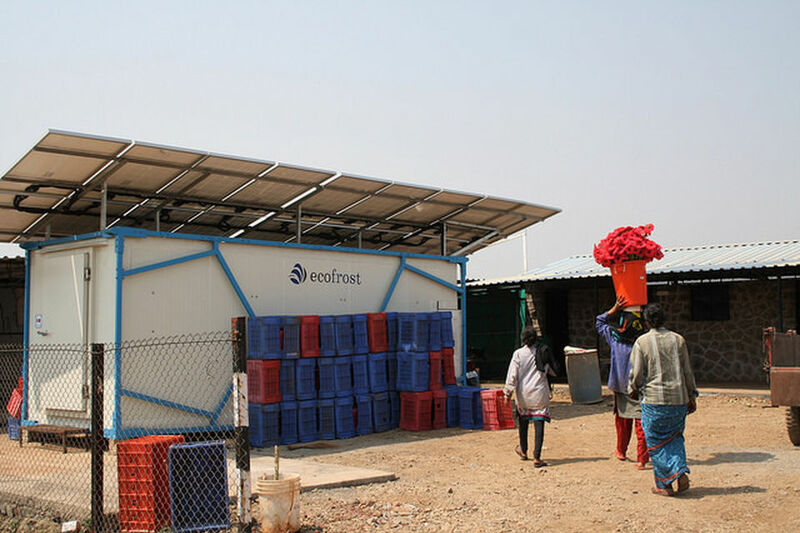 Ecozen has installed 100 Ecofrost systems, mostly in India, which are serving around 1,000 farmers. These are available through three payment models: asset-on-lease, where the farmer pays a monthly fee; pay-per-use where small farmers pay a fee per crate stored, to Ecozen directly, or via a cooperative; and outright purchase by medium and large-scale famers. A small number of systems are purchased by NGOs or Farmer Producer Organisations. Ecofrost costs approximately £15,000 to buy and is eligible for a subsidy as part of the Indian government’s agricultural policy. Some banks also offer financing for the system. Operations are currently focused on the Indian market, particularly in the Southern states and power-deficit states in the North. Ecozen has deployed a small number of systems in other countries in response to demand. The systems are manufactured and assembled in a large facility in the southern city of Pune. Most components are sourced from India. Ecozen also offers farmers after-sales consultancy on issues such as improving the quality of their crops, reducing wastage, gaining good prices and expanding to new markets. Ecozen operates a toll-free call centre and aims to educate their customers and help them get the most out of their systems. Ecofrost allows farmers to reduce wastage and sell their good quality produce for better prices. 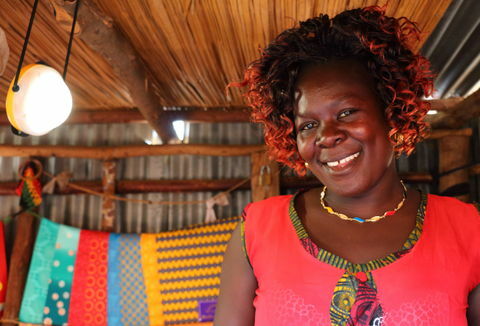 Farmers have greater flexibility to sell their produce when it suits them. For example, previously rose farmers could only keep flowers for a maximum of two days, so they would frequently travel to sell them at low prices to minimise waste. 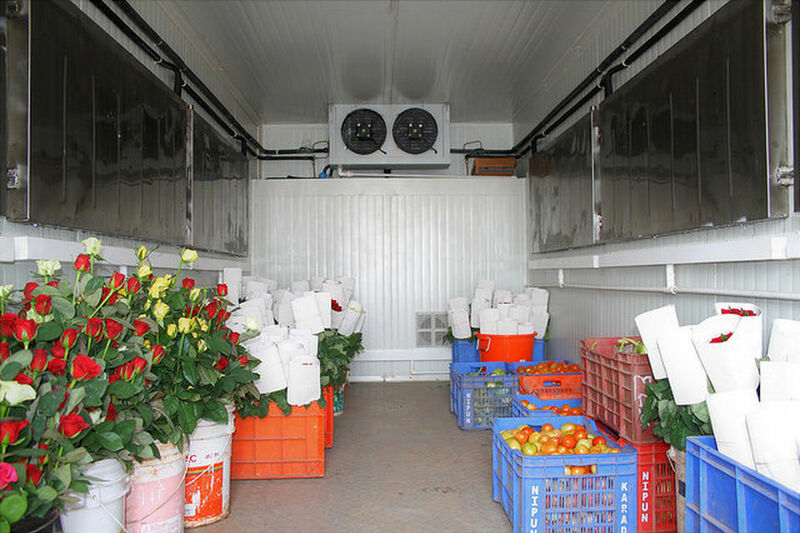 With Ecofrost, they can keep flowers for up to 21 days meanwhile monitoring market conditions and supplying good quality flowers at the local market at the right time. 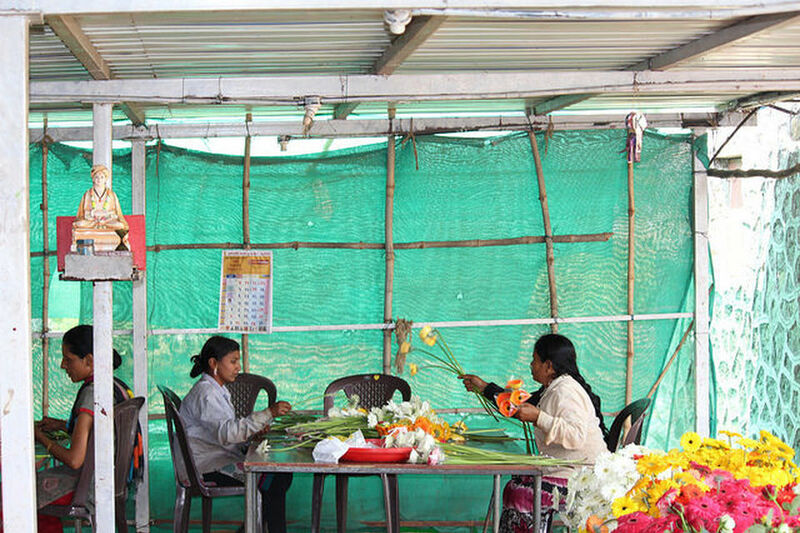 The pre-cooling feature allows the farmer to send roses to markets further away, ensuring better returns. Farmers have more confidence to grow larger crop quantities with an Ecofrost. By storing produce, farmers can extend shelf life and sell in bulk, which commands higher prices. Farmers are also able to access regular contracts with retailers now that they can guarantee a minimum cold chain supply and provide larger quantities of crops. A lower cost, modular version of the Ecofrost will be launched in 2018. Ecozen are also developing a new agriculture lab for research and crop testing at their facility in Pune to provide open source data for farmers and retailers. Ecozen’s long-term vision is to become the gold standard for cold storage and provide end-to end solutions which integrate the whole supply chain.